This is based off my mom's recipe, except I had a 1/2 package of bacon that needed to be used up. The bacon was a good idea. Chop bacon into small pieces. Fry bacon until crisp. Add the onion and ground beef, and brown ground beef. Drain off fat from bacon and beef. Add remaining ingredients and heat thoroughly. 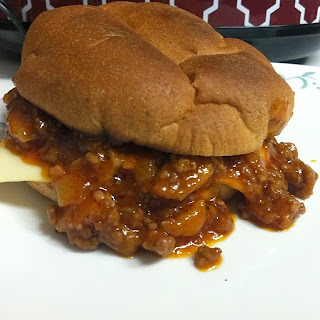 That bacon is going to make these Sloppy Joes very special. Thank you so much for taking the time during this busy season to share your wonderful post with Full Plate Thursday. Have a wonderful weekend and hope to see you again real soon! Is a Juice Cleanse Good for Me?